The Irish harp has been an article I have been looking forward to writing on my list of ancient Celtic symbols. The national emblem of Ireland, the Harp is one of today’s most widely recognised Irish symbols apart from the Shamrock. Every time I do one of these articles I see 100’s of tattoo ideas but the Irish harp is by far one of the most popular. 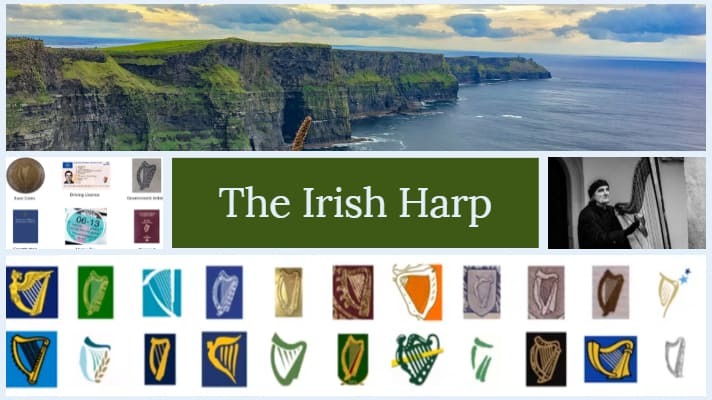 But what is the history behind the Irish harp? Let’s get into it. When I mentioned earlier that the Irish harp was one of the most recognised Irish symbols I wasn’t joking. The Presidential Seal and on many official documents. As a logo for many prominent state-supported organisations such as the National University of Ireland. On hundreds of thousands of peoples bodies – in the form of Irish harp tattoos and Irish jewellery. Ireland is the only country in the world with a musical instrument as its national symbol. Before the Irish flag you know today, we flew a green flag with a harp on it. This older flag was first flown by Irish rebel leader Owen Roe O’Neill in 1642. The word Harpa was first used around the year 600 A.D and is a generic term for stringed instruments. The verb harp means to talk on and on about one subject similar to a harpist plucking the same string over and over. The oldest harp ever found was in 1929, and it is about 4500 years old, it was found in “Ur(more details here)”. I was going to include this in the above points but found it quite fascinating. Guinness had trademarked the harp symbol in 1876, and the Irish free state government of 1922 wanted to use the symbol they had to turn the harp the other way round. This was to differ between the Guinness harp and the official state emblem. Although there is some speculation that because heraldic figures are typically left facing that the harp was originally left facing before Guinness had made this claim. If you look at any Guinness can today you will be amazed to see the exact same symbol that they used all the way back in 1876! So there is no confusion the Irish harp was the symbol of Guinness since 1862 but only trademarked in 1876. You will also see from the following picture that the symbol of the harp was not standardized over the years. As I mentioned earlier, the harp symbol is everywhere. Below are a few examples. I also have linked all sources for this article at the end. I really enjoyed the image below which is a combination of many Irish societies, Irish governments and Irish companies. How many do you recognize? As you can see the Irish harp symbol has weaved its way throughout Irish history. What else can I say about the Irish harp? Let me know in the comments and if you haven’t already, join my weekly dose of Irish where I send out all things Irish just like this article. I hope you have enjoyed learning more about the Irish harp and do encourage you to share where you can. Be sure to PIN the following image if you use Pinterest. You can do so just by clicking on it. If you enjoyed this piece on Celtic symbols you can find out a whole lot more about other Celtic symbols in this article. P.S A Harpist walks into a bar…“Need a drink?” said the barman. “Yes,” she replied, “I’m highly strung.” – Haha sorry, couldn’t resist. Pop over to my Irish jokes section for more humour. YouTube the evolution of the Harp – A 1-hour lecture on the harp!